I'm not an overly patriotic kind of chick. But ever since my son served several years in the Army including one tour in Iraq, I have a deeper place in my heart for days like Memorial Day and Veteran's Day. Of course I have always had great admiration for those who served and great empathy for those whose lives were taken during this service. As a mother of a son who has fought a war, and watched and waited almost helplessly as my lovely tenderhearted son struggled to reaclimate to everyday life, I carry a concern for all the young men whose hearts and minds have been permanently altered by their experiences at war. And before I go over the politically incorrect deep-end, I will just say, they deserve our appreciation, care, and support. Ever since I saw a really cool picture of a heavily distressed wooden hanging in someone's office, I have wanted one of my own. So when I found a huge - and very heavy - fence panel in a neighbor's trash last year I dragged it into my car and drove home with it hanging out of my open trunk. Then it sat. And sat. Last week when I realized Memorial Day was upon us I thought it would be a good time to make good on my vision. I looked and looked for my inspiration photo but I could not find it anywhere. Not on Pinterest nor in my stash of photos that I used to save before Pinterest. But I made it anyway, by memory. Now you can make one too! All you have to do is find a fence. Or a pallet. Or any found wood. Hopefully you wouldn't have to actually BUY wood. Take your fence apart. A hammer and a pry bar are very helpful here. 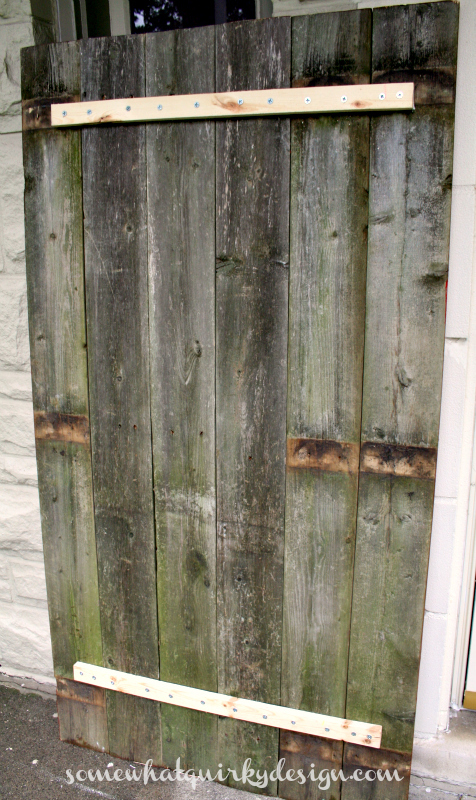 Put your wood pieces together with wood stripping (1 by 2's) and wood screws. Cut off the rotten ends and the shaped ends. Turn it over and measure out your lines. I wanted my flag to be anatomically correct so I looked up a picture of how to lay out my stripes and stars. Red stripe on bottom and top. 5 rows of 6 stars and 4 rows of 5 stars. The math goes like this. Measure height of flag and divide that measurement by 13. That is how deep each strip will be. The blue stars section begins above the 6th stripe from the bottom. The right border of the blue section looked like it was a little over 1/3 the width of the flag. Mark that off. Measure the stars area. The height divided by 9 is how deep your rows for the stars will be. The width divided by 6 is how wide the area will be for the rows that have 6 stars. Mark off your rows of 6 stars and then mark your rows of 5 by placing the stars in between the spacing of the rows of six. I made a stencil to get the right size of star then traced where each star would go. Paint your entire flag. I used Annie Sloan Chalk Paint in Emperor's Silk, CeCe Caldwell Vintage White, and American Craft Paint in Mercurial Blue. I painted it fully because I wanted the distressing to take of the top and to have paint remaining in the lower areas. If you just paint wash you get the opposite effect. Then get your power sander out and get busy making it ugly. I think I took off at least 1/2 of the paint, maybe more. I waxed it with CeCe Caldwell's Light Antiquing Wax and then 2 heavy coats of Minwax. I used Minwax for this because I wanted a very hard wax finish, and because I wanted to save my more expensive waxes for furniture and projects where I'm more particular about the wax. After you have rubbed out your wax, you are all done! Put it out on your porch and have a moment of thanks for Veterans of all ages. Love that! I've wanted to make one of those too! Thank goodness there's still July 4th.....maybe I can do it by then!! I really like this, but it looks like it's really mathy. I am not mathy. Now all I need to do is find some old wood! Thanks for sharing. I have a photo saved from an old Country Living with a similar flag that I'd love to recreate. You've made it sound easy, so if I ever get around to it, I'll know just where to look! 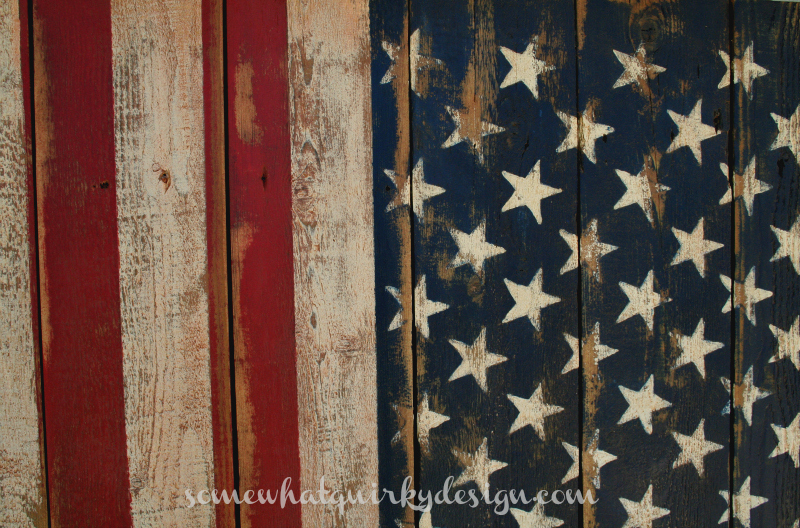 I LOVE your wood flag!! You've given me a great idea. My husband ran into a cabinet door in the garage so I removed them both. I think I might just be able to use one of them to do a flag. That's fabulous Karen - LOVE it! Love it Karen!! Amazing!! You did a great job. Good for you with the math and everything! I love having the how-to on things with measurements and particulars like the stripes and stars. It's important to get it right. Thanks for figuring it all out! And thanks to your son for serving our country, and thanks to you as his mom for seeing him through! It is its own work being mom or dad to those who serve in the military. Oh, I absolutely love this! Truly I do! I just pinned it and plan to make one. Thanks so much for sharing this. Found you via Shabbilicious Friday. Karen I love this project and I really love that you've taken all of the guess work out of it! Pinned it and hope to try some variation of this. I am grateful for your son's service. 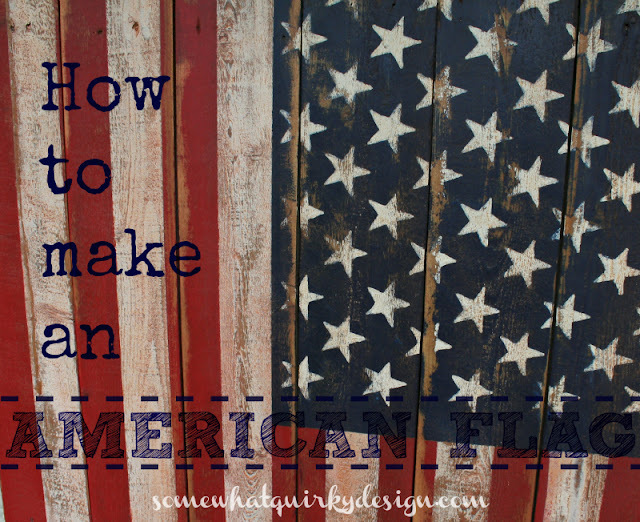 With your excellent tutorial you've taken the guesswork out of making the flag. What I really love is the thought that prompted you to do it. Beautiful job...love, love, love it! I'd like to point out one part on US flag etiquette. When a flag is hung vertically the stars should be on the upper left. So before painting the stars and stripes one should determine whether they plan to hang it vertically or horizontally. Joy this reply is for you...Oh man! That kind of stinks because I intend to use the flag indoors going horizontally and outdoors vertically on the 3 times of year I would fly a flag. That etiquette rule doesn't really make sense to me because then you can only use the flag one way. Thanks for letting me know Joy. You did an amazing job on this project Karen. Thank you for linking up at Shabbilicious Friday. I host a weekly linky party and would love for you to link up! Great job Karen. Very doable tutorial and I am anxious to try to make one. I have a lot of boards that might work. Thanks to your son for his service. Do you know how I could get the antiquing wax or could you share a link? Thanks. Ashley you can purchase the wax at the Bungalow 47 website. Here is the link for the wax. You can use the light wax or the dark wax. I used the light but actually prefer the dark. your post said cece caldwells light antiquing wax so I just want to make sure. thanks again! Yes Ashley that is it. Good luck! I definitely love the flag, beautiful work! Came over from Junkers Unite. 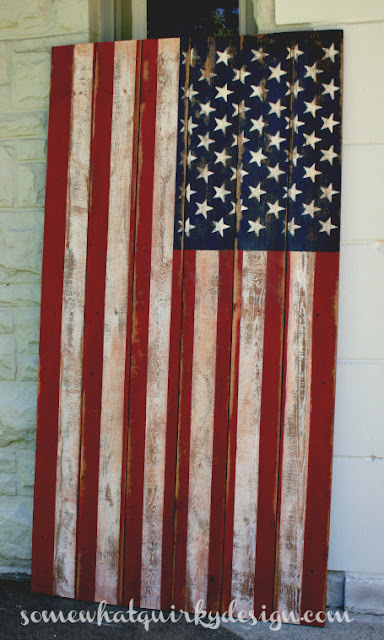 I collect Americana items - love this flag idea. 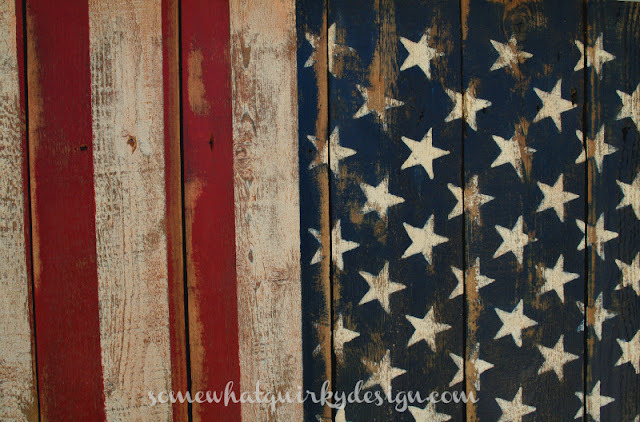 What a great project using old wood, I love the rustic look! I'm back again, one year later, to admire and think about doing!I 'm glad that I saved it to my red, white and blue board on pinterest!!! Quick couple of questions! I've never made anything look distressed before. Can you clarify the paragraph about waxing? And what it means to rub out the wax? Also, I love how right where the boards are touching you took almost all the paint off in some areas-- did you take the boards apart to do this? Or did you just turn the sander a particular way to get such a thin line? Thanks for all your help, and thank you to your son for his service! Hi Sami! I'm so glad you are making the flag! Your email wasn't attached to your comment so I'm answering here and hoping you will check. To answer your questions...rubbing out wax is just buffing. buff this a lot- until the rag skids over the surface of the board. To distress I did not do anything special - just sanded with my orbital sander and medium grit sand paper - maybe 120grit? The reason the edges of the boards sanded like they did was just because that's the way the boards were warped so the edges stuck up a little higher than the center of the boards. No I did not take the boards apart to sand. That would have been a LOT of work! Have fun! Very cute. 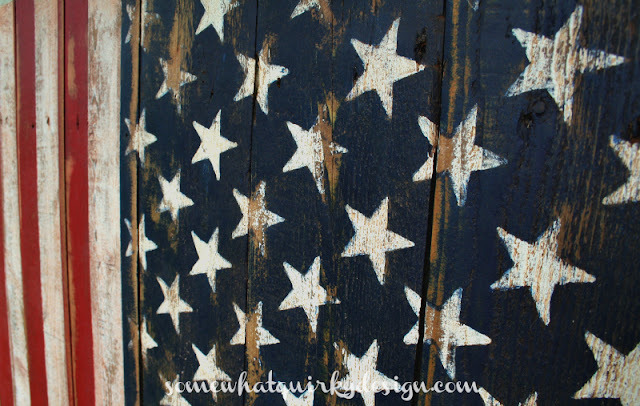 I always have my eye out for distressed flags. Looks great. Did you use painters tape to get the perfect red and white lines? That is the only part that is scaring me! I know I can put the tape on and paint the red, but then how do I paint the white without smudging? Put tape on top of the red I have just painted? Beautiful project! One important note, though, for others who do this project: the flag is oriented wrong. The blue should always be on the left upper corner, when it's hung horizontally OR vertically! I made this mistake myself and was corrected by a kind neighbor, who was himself a veteran. Look up flag etiquette for a visual. Thanks for a great idea, and for the tutorial. I love your flag! It looks so amazing! It would be a great back drop for photos too! Thanks so for linking u to Project Challenge! Also thank you to your son for serving our country! This is fabulous! Thanks so much for sharing it at Farmhouse Friday. Jeanne this is for you - I don't have your email address. I believe that I traced the stencil on then painted the blue around the lines of the star. Then I painted the white stars. I've been trying to post a pict of my project. The only difference is that I had a wooden Lone star in my art supplies so I attached it instead of the 50. 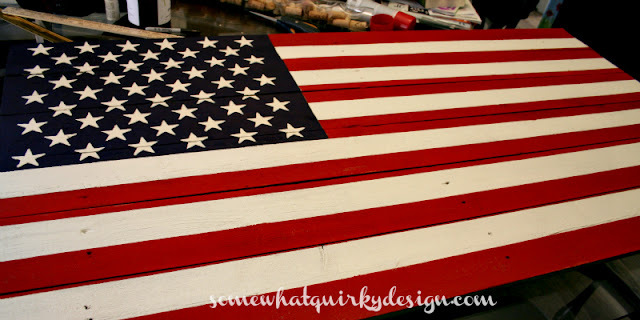 I had already painted a window with the 13 red/white stripes and the 50 stars.. I want to make this flag and was having no trouble following your instructions until I got to the part about the stars in the blue area....then I was lost. Any possibility you could explain that in laymans terms. Thakn you. Hi! I love this project and plan to make my own. Someone commented earlier with the same question I have...How'd you get the perfect stripes? Did you hand paint along a line or did you use painters tape in between coats drying? Sorry so late to reply! After you have your lines drawn in the blue section lay out your lines of 6 stars. For this devise the width of the blue area by 6. Take that measurement an mark every ???? Inches ( whatever your answer was from your equation ) put your white star in the middle of each area you marked off. After you have done this all you have to do for your lines of 5 is place them in-between the stars in the line of 6. Does that help? Love this! Was wondering why you used wax instead of poly? Is it preference or is something different about it? I have never worked with wax but have used polycrylic many times. Just wondering if I used poly if it would affect anything. Thanks! This is a lovely item and I appreciate the work you've put into it; however, when our U.S. flag is hung vertically the stars MUST ALWAYS be in the upper, left corner. Regardless of the direction it's being hung, the stars are ALWAYS to be top left meaning "Union first." Your flag is backwards. The blue field should always be on the right (from viewers perspective). Not yelling at you just flag etiquette.